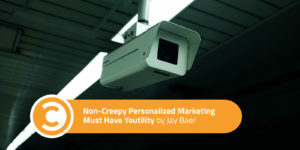 Is personalized marketing good, or evil? I’ve been asked some form of this question so many times, in so many places, by so many different types of companies. I figured I should answer it here, in writing. Actually, you may have ASKED this question—if not of me, of someone. Maybe of yourself? We think that this line is thin, and that just the slightest push toward additional customization based on behavior or inferred intent will send potential customers running, afraid that “big data” has run amok. The reality is that the line is actually pretty wide. Customers are, in fact, exceptionally tolerant of personalization (even hyper-personalization) as long as ONE THING IS TRUE: The personalization must either inform or reduce friction, period. In short, the personalization must be a Youtility. This may seem axiomatic to you. “Of course, if we’re going to personalize, it should be in service of an enhanced customer experience,” you may think. But that is by no means always the case, is it? If you’ve ever bought a product and then seen ads all over the damn internet for the SAME PRODUCT YOU JUST BOUGHT, you know that personalization isn’t always useful, and sometimes can be downright irksome. Understanding that personalized marketing must be useful—so useful that people would pay for it, to quote the definition of Youtility—is critical. Because we are very quickly entering an all-new era of digital marketing; an era where the availability of big data makes it very, very easy to personalize customer communications and interactions in a way that would have been unthinkably complex just a short time ago. We’ve talked about the power of 1:1 marketing for a long, long, LONG time. But now, artificial intelligence and machine learning have teamed up with real-time data collection to give just about every marketer the option to personalize some, or a lot, of the customer experience. Ask yourself that, and your personalization efforts will always contain enough incremental usefulness that customers will largely embrace it, even when it is FREAKY. Look at Netflix, for example. 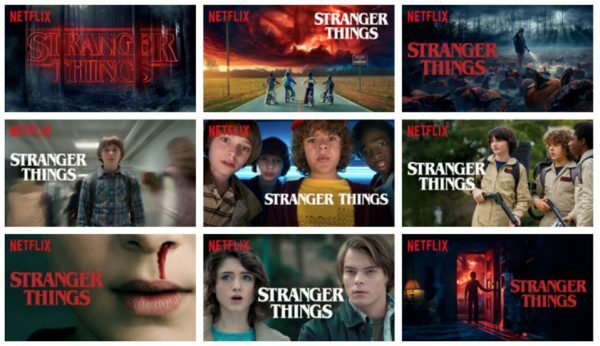 In an extraordinary column on Medium published last month, Netflix data engineers described, in detail, precisely how they create as many as a dozen different pieces of “cover art” for every Netflix show. For the movie Good Will Hunting, for instance, Netflix serves up different images based on whether it thinks your affinity is stronger for Robin Williams or romantic comedies. Someone who has watched many romantic movies may be interested in Good Will Hunting if we show the artwork containing Matt Damon and Minnie Driver, whereas, a member who has watched many comedies might be drawn to the movie if we use the artwork containing Robin Williams, a well-known comedian. You might think this is at least a little invasive. It’s definitely fascinating, looking at the same programs on Netflix when you’re logged in as yourself versus as your spouse, to see what the algorithm has determined each of you prefers. But we tolerate this data mining because it has enough Youtility for us. The trade-off between loss of privacy and more compelling video content recommendations seems like a good deal. You may not have a room full of data scientists cooking up this kind of personalization. (When I first read the Netflix post on Medium, when I got to the part about HOW it works, my head almost exploded.) But you don’t need scientists. You need to understand that personalization is just a value exchange, the same way that asking for an email is a value exchange. The same way that connecting with someone on Linkedin is a value exchange. The same way that paying someone to mow your lawn so you have more time to do other stuff is a value exchange. As marketers, assisted by robots, our ability and opportunity to personalize with data is wizardry made commonplace. But we cannot ever forget that our audiences—not us—are those that decide what is satisfying and what is creepy. They decide what is clever and what is stupid. They decide what is in bounds and what is out of bounds. And in almost every case, that decision is based solely on whether or not the personalization makes their lives better, or just helps you sell more stuff.